All of us at Evans were excited and happy to photograph 3 year old Ayden Konakowitz and his family as part of Oprah's Big Give Dakota. Ayden has a rare form of kidney cancer called nephroblastoma. The community has really pulled together to help this remarkable family who were presented with a new home complete with their new family portrait yesterday. Around 500 people came out to share in the "big reveal" of their new home. 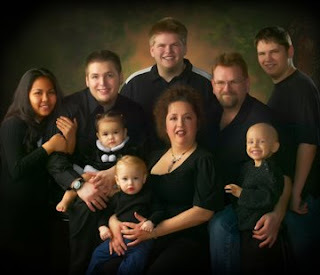 We are blessed to be a part of this beautiful family's inspirational story. I would like to thank Mr.Evans and his staff for his hospitality and vision to make this wonderful family portrait for us. It was the best gift ever. It truly completes our home. Thank you again, you are the best! God bless. Monica DeLeo-Konakowitz.